This is one of Holly’s favorite southwestern salads, and it’s great for a one-meal dish. Holly adds 1 cup frozen corn, thawed and 1 15-ounce can of black beans, rinsed and drained for added benefits and flavors. In a large nonstick pan coated with nonstick cooking spray, cook the meat, onion and garlic over medium heat, stirring to crumble, about 5 to 7 minutes, or until the meat is done. Drain any excess fat. Add the cumin, salt and pepper and rice. Remove from the heat; cool slightly. 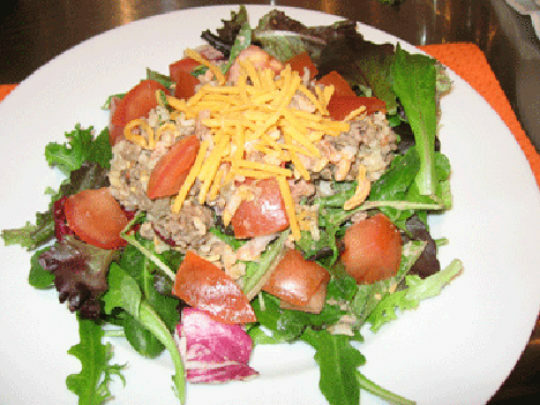 In a large bowl, combine the lettuce, tomatoes, cheese, red onion and rice mixture. In a small bowl, mix the sour cream and salsa. Toss the dressing with the lettuce rice mixture. Serve immediately with the picante sauce and tortilla chips, if desired.